Andrew Forsthoefel is a writer, speaker, and peace activist living in the Pioneer Valley of western Massachusetts. After graduating from Middlebury College, he was ready to begin his adult life, but didn’t know how. So he decided to take a cross-country quest for guidance, in which everyone he met would be his guide. In the year that followed, he faced an Appalachian winter and a Mojave summer. He met beasts inside: fear, loneliness, doubt. But he also encountered incredible kindness from strangers of all different kinds. Thousands shared their stories with him, sometimes confiding their prejudices, too. Often he didn’t know how to respond. How to find unity in diversity? How to stay connected, even as fear works to tear us apart? He listened for answers to these questions, and to the existential questions every human must face, and began to find that the answer might be in listening itself. After his year-long walk across America, Andrew began telling the stories from his transformative journey. 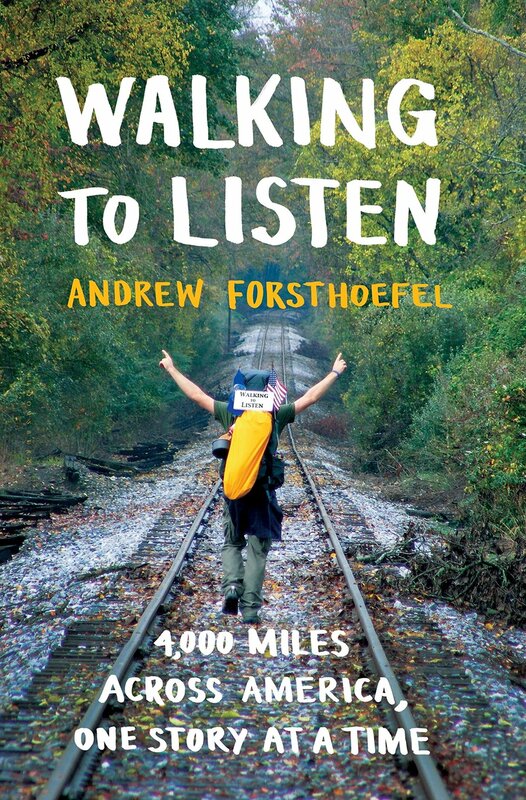 He co-produced a radio documentary about this project that was featured on "This American Life," and his book, Walking to Listen, goes deeper into the stories and explores the practice and philosophy of walking to listen. Andrew now writes and speaks about the discipline of listening and its role in the work of reconciliation, transformational resistance, and peace-making at the personal and collective levels. He is an itinerant teacher, offering walks and workshops that train participants in the work of becoming a trustworthy listener. His work is a contribution to the collective project of learning how to be alive together with love, by listening—united by our diversity, empowered by sharing the unavoidable vulnerability of being human, and freed by opening up to ourselves and one another. Livingtolisten.com is the online home for his work, and he lives in the Pioneer Valley of western Massachusetts. 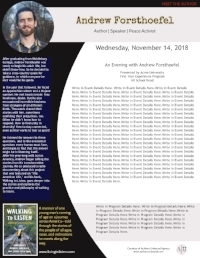 Andrew Forsthoefel is a speaker, peace activist, and the author of the book Walking to Listen. After graduating from Middlebury College, he spent a year walking across the highways of America, an apprentice to the discipline of listening. His narrative work has appeared on This American Life and The Moth, and he teaches trustworthy listening as a practice in reconciliation, personal transformation, and peace-making. Livingtolisten.com is the online home for his work, and he lives in the Pioneer Valley of western Massachusetts. Thanks for considering Walking to Listen, a travel memoir about a year I spent walking across the highways of the United States after my graduation from Middlebury College in 2011. It was a year of radical vulnerability and remarkable connection, with people across the vast and varied spectrum of American humanity. The book tells the stories of these encounters. It is, I believe, a documentation of what’s possible with the ability and willingness to listen. Released in March 2017, the book has already found its way into classrooms at the high school and university levels. My hope is that it might serve your community in some way: as an all-school read, a first year experience text, or a tool for your English classes, spiritual life programs, mindfulness groups, diversity and inclusion initiatives, and peace-work organizations. In working with students myself, as a speaker and listening teacher, I have found that the shock and awe factor of a walk across America opens young people to conversations they might otherwise avoid, about truth and reconciliation, race and privilege, and all the personal vulnerabilities that come with growing up. On the surface, the book is an adventure story. Not far beneath, however, it’s a rich inquiry into the experience of being human in this time and place. How do we grow up in America today? What is our understanding of adulthood, and what are the means by which we come of age? How does our collective history inform who we become as adults, and how does it influence how we interact with one another? What are our present moment responsibilities, as the inheritors of the wounds of slavery and colonial conquest? How is the practice and discipline of listening an integral part of the way forward? What is listening, to begin with? How do we do it? Why don’t we?